Many factors can cause rock and soil to move downhill. Sometimes the movement is slow, but often it is fast and can destroy homes or cover roads and highways. This section introduces you to landslides, one of the most common geologic hazards in North Carolina and the processes behind them; scroll down for more information. Also available on this page are links to county-specific information for the four North Carolina counties that have mapping completed for landslide hazards, Macon, Watauga, Buncombe, and Henderson. These counties are shown on the map below. Select from the the county name listings above or below the map to view available landslide hazard information for that county. 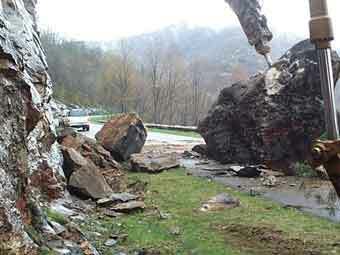 Landslides are most common in the mountain region of North Carolina because of steep slopes. The Piedmont and Coastal Plain regions also have landslides that are commonly related to human activity such as making a road cut too steep. Large rainstorms, hurricanes, freeze-thaw processes and human activities all can trigger lanslides. There are many types of landslides made of different types of material that travel at different speeds. Some landslides only consist of soil, called an earthslide. Some are a mixture of soil, rock trees and mud, called a debris flow. Other landslides contain only rock, called a rockfall or rockslide. The following images show selected examples of the destructive effects of landslides. One example of the direct and indirect cost of landslides is the Pigeon River Gorge rockslide (see below). Road repair and stabilization costs exceeded $10 million. Indirect costs, such as interruption of business, commerce and tourism because of lengthy detours, probably exceeded $5 million. (Above) Boulders on the Blue Ridge Parkway from the April 24, 2003, rockslide near Potato Field Gap, northeast of Asheville. The 165-ton boulder is being broken down to fit into a dump truck (Above) Scar from the 1997 rockslide along I-40 in the Pigeon River Gorge. The rockslide closed the highway for more than 20 days. In this image, clean-up efforts have removed most of the debris pile, a retaining wall has been constructed and I-40 has been reopened. Landslides can be very small, like those on the side of a ditch, or they can be as large as mountainsides like this. This rockslide was caused, in part, by the nature of the underlying rock. Most rock formations have layers similar to a stack of books. If you tip a stack of books they will slide off each other just as tilted layers of rocks can slide off a mountainside. The layers of rock are planes of weakness where the landslide separates from the side of the mountain. Geologic maps show how these planes are oriented and the maps can be used for route planning. 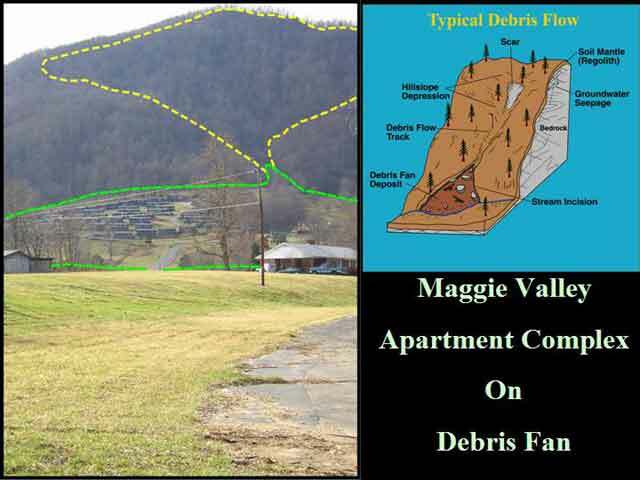 (Above) -- Apartment complex in Maggie Valley, North Carolina, built on debris fan deposits (green outline). The apartment complex is built on an old landslide and stream deposits at the base of a mountain. The landslide deposits have accumulated because of recurring landslides and where they have happened in the past, they can happen in the future. Inset image on right of image shows general elements of a debris flow -- described in more detail below. The trained eye of a geologist can discover hints that the land is currently moving and uncover clues as to where it has moved in the past. Evidence that the land is moving include cracks that appear when the land is slowly pulling apart from the hillside. These cracks are called tension cracks. 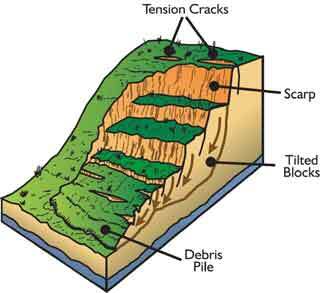 With time, the ground on one side of the tension crack may slide downhill forming a scarp (see illustrations below). If the ground moves far enough, it will leave a mark called a scar. A fresh scar will usually have a lighter color and no vegetation compared to the surrounding slopes. (Above image) This is where a debris flow, a type of landslide, was triggered in Henderson County by heavy rainfall from the remnants of Hurricane Francis in 2004. Tension cracks indicate areas on the ground have pulled away from the hillside. 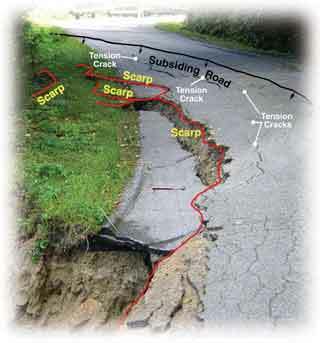 Scarps indicate areas that have already dropped down; with time, tension cracks in the pavement will likely become scarps. 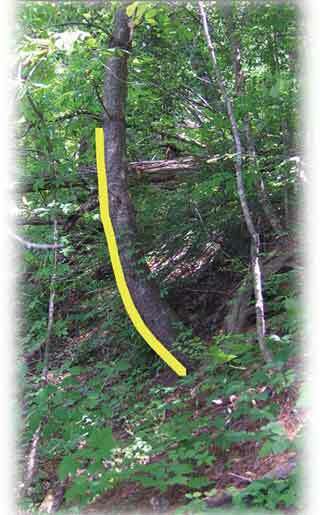 Another clue that the land is moving is trees growing at an angle or with bent trunks as shown in the two images below. Trees growing on the side of a hill normally grow straight up. If the land is slowly moving downslope, the trees will lean, but keep trying to grow straight towards the sun. This process results in their bent growth pattern and indicates the trees are slowly sliding down the hill on top of the landslide. This should be a warning that the land may move substantially with the next large rainstorm. (Above) -- Tree showing curved growth. 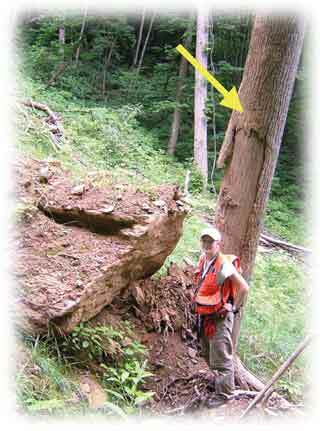 The curved growth pattern (yellow line) indicates the tree is growing on top of a slowly moving landslide. 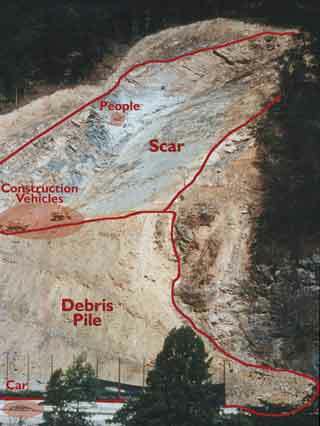 (Above) -- A landslide can carry a lot of debris. This debris flow took the bark off the tree 10 feet above the ground indicating the flow as about 10 feet deep at that point. It also carried the large boulder downhill, bringing it to rest next to the tree. A landslide can leave a trail of destruction along its path and a pile of debris at the end of its journey. Hurricanes in the Mountains -- Hurricanes not only affect the coast, they can move inland and drop tremendous amounts of rain. A single hurricane can substantially affect a large area. If consecutive storms hit an area within a short period of time, the results can be devastating. 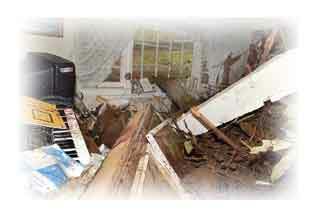 Such an occurrence happened when the remnants of Hurricanes Frances and Ivan passed through the North Carolina mountains within a two-week time span in September 2004. The large amount of rain falling on steep, unmodified slopes in such a short period of time triggered the more than two-mile-long debris flow. Ivan dropped between 4 to 6 inches of rain, with higher elevations receiving 10 or more inches of precipitation. This rainfall was in addition to the remnants of Hurricane Frances that dropped 6 to 10 inches of rain, with many areas receiving greater than 10 inches. This landslide was most likely because of steep slopes, shallow soil and large amounts of rain. Mountain counties were hard hit by these back-to-back events with destruction to property and transportation routes throughout the region. (Above) -- The Peeks Creek debris flow destroyed or damaged 15 homes, and five fatalities, including an unborn child, were reported. The debris flow pushed this two-story home 30 feet off its foundation. The piles of debris to the right of the house are the remnants of an adjacent house that was destroyed. (Above) -- In a subdivision in Watauga County, one home was destroyed and eight others condemned for occupancy by landslides related to Hurricane Frances in 2004. 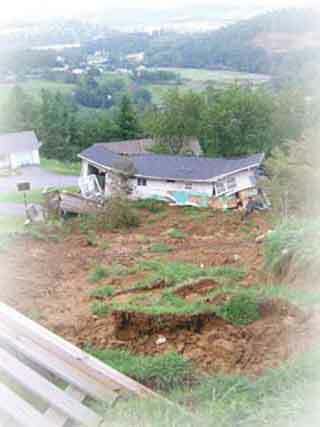 (Above) -- This landslide, caused by Hurricane Ivan in 2004, destroyed this home in Starnes Cove, Buncombe County. Photo courtesy of the Asheville Citizen-Times online edition. North Carolina Geological Survey, 2005,When the Earth Moves, Randy Bechtel, editor: Information Circular 32: North Carolina Geological Survey, Raleigh, North Carolina, 24 p.
Varnes, D. J., 1978, Slope movement types and processes: In: Landslide Analysis and Control: In Schuster, R. L., Krizak, eds. Transportation Research Board Special Report No. 176, National Academy of Sciences, Washington, D. C., P. 11-33.